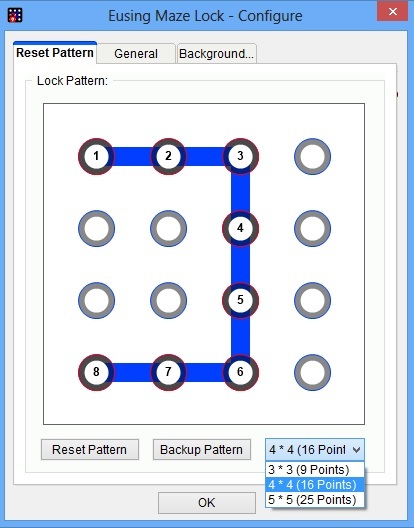 Pattern locks are normally used on smartphone these days, now you can use the same Pattern Lock method to lock your windows PC with the help of Eusing Maze Lock free application. 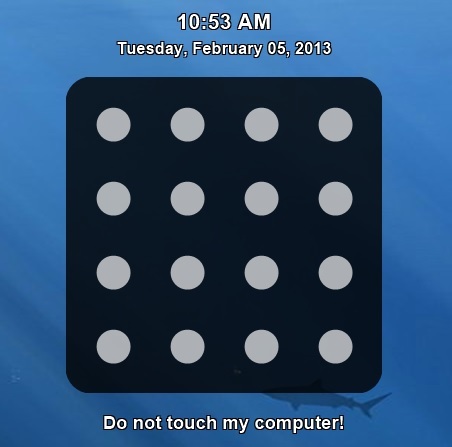 With the help of this tool called Eusing Maze Lock you can setup customizable lock screen for your Windows PC. Instead of using password to unlock your Windows, you can setup pattern lock to unlock PC. The app is free to use and provides the users with varied options to customize the locking system according to their needs. With this app you can customize your lock screen, customize pattern, backup patterns and add multiple monitor support. To use this app, all you have to do is install the app on your Windows PC. After the installation open the app and you can see the main screen of Eusing Maze Lock. From here you can reset the unlock patterns and create you own pattern to unlock your PC. To make the pattern a more complicated user can select the number of points among 3*3, 4*4, 5*5 patterns. Once you set the pattern lock for your PC, you can also take the backup of that pattern on your PC. Using that option you can save the pattern as backup in case there is a risk of forgetting the pattern. 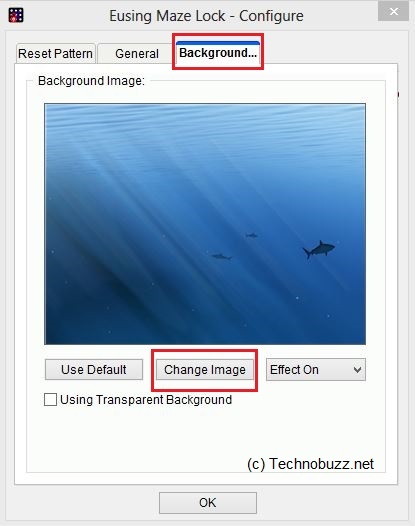 From Background Tab menu from the app you can change the screen background of the lock screen, just click on the change option from there and you can select you personal image to set as a background. From the General tab menu you can change the settings of lock screen like time for auto lock, default auto lock, monitor turn-off, keyboard locking, number of attempts for pattern entered etc. 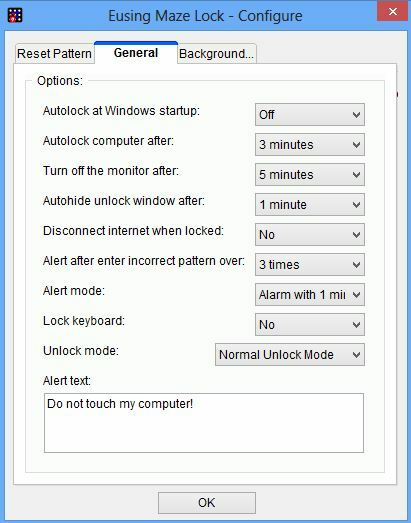 Once the settings are saved you can use the pattern lock on your Windows PC. To unlock PC all you have to draw thew pattern with the help of mouse and you pc will unlocked. All we can say that the app is a useful application that serves its purpose and provides some interesting configuration options.